I recently watched the 2014 Science Fiction (SF) movie, “Edge of Tomorrow”. I like SF stories, and this was a good one, with lots of action and excellent visual effects. It wasn’t until after I’d watched it, that I realized that it was also a powerful allegory on Knowledge Management (KM), offering a several important lessons. The following paragraphs summarize the plot of the movie; so if you want to see the movie first, STOP READING NOW! For the rest of you… In the movie, an Alien force has invaded Earth and conquered mainland Europe and Asia. The combined forces of Earth are battling the aliens with no success. Now, however, armed with new technology combat suits, the forces of the Earth are confidently preparing to invade Europe from England and defeat the Alien force. But, unknown to the forces of Earth, the Aliens have a secret KM weapon. They’ve learned how to reverse time. Whenever an alien warrior dies, time for it is reversed and it returns to life, but now with the added knowledge of the circumstances of its prior demise. A central alien leader accumulates these lessons from thousands of these deaths and shares them with all of the other warriors. So, as time is re-lived, alien death by alien death, the invading force learns and adapts and overcomes, while the unaware humans, continue to use yesterday’s seemingly successful tactics, only to learn that they don’t work today. 1. Knowledge is power and those with better, more current knowledge will out-perform those without. The Aliens perfected KM as a weapon of inter-stellar conquest and have used it successfully for a long time. The people of the Earth, stumble upon the KM weapon, try, fail, learn and repeat the process until they achieve a superior knowledge set and action plan that will defeat the Aliens. 2. Knowledge is gained through action and intelligent failure. The aliens perfected KM in to a powerful weapon. The hero gains access to this KM process, and by multiple trials, and failures (being killed) learns enough to succeed. 3. You can never have enough knowledge. The effectiveness of knowledge-based actions is dependent on context. Context is constantly changing, so our need for new context knowledge and adapted actions plans must also be constant. Learning bias. The Alien view of knowledge acquisition was not as a goal, but as a way of life. 4. Centralized knowledge databases create significant risk. Seeking to build central, “one stop shopping” knowledge repositories, that can be updated and controlled on the surface, appears to be worthy goal, but I believe that this goal is unrealistic, counter-productive and perhaps even dangerous. The goal should be the identification and integration (intelligent searching) of knowledge bases wherever they are. The aliens had powerful and well-protected central knowledge source, but it was also had single-point failure vulnerability which the humans ultimately exploited to defeat them. 5. Shared knowledge is more powerful than knowledge held. The aliens captured planets by using shared knowledge as a weapon. Each time Tom Cruise died, he shared knowledge with his co-star, Emily Blunt, and together they build a shared knowledge base that will defeat the enemy. 6. Be wary of what you think you know. Early in the battles with the forces of the Earth, the aliens “allow” them win a battle here and there in order to expose their tactics, learn from them and exploit weaknesses. The Earth forces assume that context and relevant knowledge are stable, and that their tactics are sound and their technologies are adequate. But, when they try to use yesterday’s successful tactics and technologies in todays battle context, they fail. So here is my review of the “Edge of Tomorrow”. It can be viewed as a superficial, mindless flow of good action entertainment or it can be more thoughtfully viewed as a KM training film. I give it 3 stars out of 5 stars as an action flick and 5 stars out of 5 stars as a KM flick. Your experience may vary and I’d be interested in your thoughts. This entry was posted in Better Thinking, Knowledge Sharing, Leadership, Program & Knowledge Management, Science Fiction and tagged Sci-Fi. Bookmark the permalink. The Try, Fail, Learn and Repeat process immediately has me drawing a parallel to the Plan, Do, Check and Act (PDCA) Cycle. There are many applications for the PDCA Cycle, only one of which could be as similarly applied to Knowledge Management (KM). In which case, we begin by making a PLAN for what we want to try. Succeed or fail trying to DO it. 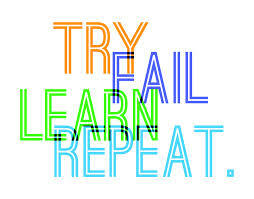 CHECK to see what we have or have not learned as a result of succeeding or failing. ACT as needed to complete the cycle based our original/revised plan. Repeat the PDCA cycle taking care to feed forward lessons learned. I think we can learn from both “intelligent failure” and intelligent success. However, both require being guided by theory in order to understand why we failed or succeeded. 1. Knowledge Management – Try, fail/succeed, learn, repeat. 2. Training others – TELL them, SHOW them, they DO, you FOLLOW-UP. 5. Project Management – Initiate, plan, execute, monitor and control, close. I checked the box that said “notify me of new comments via email.” I look forward to receiving and reading them. Excellant observations Don, thank you for sharing.